Real estate, like any other business venture, is heavily focused on the consumers. You need clients to sell properties, and to gain clients you need solid brand image. But, to build a brand you need to sell properties, quite a vicious cycle, right? With a responsive real estate website, you can easily solve this paradox. WordPress.org is what we call the king of all blogging platforms. Everyone knows about WordPress, the giant web development hub that supports over a million domains worldwide. However, contrary to popular belief, WordPress is just not limited to blogs. Many brokers, developers and top local real estate agents use this platform to design powerful property listing websites. There are tons of premium quality themes, templates and free layouts that can be customized to your liking in a few clicks. Add images, insert graphics, enhance the SEO, embed widgets, add CTA buttons, start newsletter campaigns, add contact forms, and call-back options. Wordpress is your go-to website building tool. WordPress is also integrated with the cloud, giving you unlimited storage space and bandwidth, so you don’t have to worry about the size of the listings and content posted anymore. 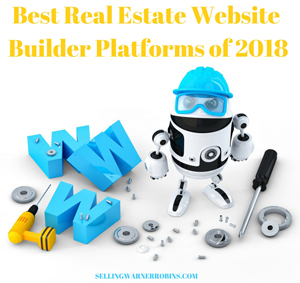 There are tons of plugins and applications by WordPress that facilitate real estate businesses that you can use for the website. Also, here you can also create a separate mobile-friendly version of your website that’s compatible with the screen resolution of the smaller devices. Wix is a multipurpose website builder that you probably must have already heard of (or worked on) if you’re into web development. A fun, intuitive, and clutter-free interface, a dashboard loaded with editing tools, the super responsive framework and tons of other advanced options make Wix a top choice for both amateurs and professionals. It pulls out some amazing themes, pre-made templates and premium real estate website layouts for clients that can be customized in minutes. You simply have to drag and drop the required elements on the interface and apply the various color schemes, fonts, and graphics to it. The on-site live canvas editor allows you to make some quick real-time tweaks on the content. Wix doesn’t leave a single stone unturned when it comes to enhancing the reach and appeal of your real estate website. The blogging CMS solutions, built-in SEO tools, and e-commerce options are all part of the reason why Wix is so popular. The technical help-desk is pretty user-friendly and responsive. You can contact them via emails, phone, live chats, video calls and messages. Also, with Wix, you can share your content on social media networks. Issue contact forms, add powerful CTA buttons, link your Facebook and Twitter pages- there are endless possibilities for expansion of your real estate business. uKit is a drag and drop, a code-free website builder that targets growing start-ups, amateurs and first-time users who want to build fully functional websites. The WYSIWYG interface is truly intuitive and gives you accurate insight on how the website would look on the browser once you publish it. It, therefore, saves busy realtors the trouble of actually having to redo and reform the mistakes after uploading the content. Beautiful real estate themes and a wide range of graphic assets add the much-needed aesthetic charm to the platform. With uKit, you can establish quick and convenient customer interaction options such as live chat and call-back functions so that you don’t miss out on the potential buyers for the properties listed on your website. uKit also has inbuilt SEO and a powerful CRM integration feature that assists you in better management of the builder/buyer relations. Note that you’d need a CRM account to access and import the necessary information to your website. IDX integration means you can leverage the multitude of listings from a multiple listing service (MLS) and integrate them in your real estate website. uKit is also great for coders and tech-savvy developers who would love to work on HTML and CSS style-sheets. Real estate is a fast growing market with a lot of potential for brokers, agents, and realtors. There is no dearth of demand, in both residential and commercial properties. Also, clients are way more specific and sure about what they want. Buying and selling land is a pretty complicated process controlled by various legal impositions. Don’t worry, website builders like AgentBizzUp, got you covered. The robust, reliable website builder has all the necessary tools and facilities you’ll possibly need to design a property website. It assists you in creating a visually rich and credible website where people can browse through properties’ listings, see property images, and contact the necessary people in a jiffy. AgentBizzUp is a WYSIWYG platform, i.e., developers can have a look at their website as it would appear on the web browser. The point and click interface is user-friendly and comes with tons of editing options. You can edit the color schemes, add images, embed widgets, insert graphics and do so much more. Some popular widgets like Page Modules and Listings allow developers to categorize the information in a better manner and boost the user experience. Moreover, additional functionalities like analytical tools, events manager, calculator, newsletter options make the whole real estate website the equivalent of a marketing platform for realtors. RealEstateSites, unlike other platforms, isn’t just about posting good content. It is also about listing the accurate property information and establishing a link between the buyer and the seller. RealEstateSites website builder assist developers with just that. This real estate website builder offers the perfect balance between aesthetics and robust functionality. Armed with cool tools and editing solutions, this drag and drop interface has designed is the enabling power behind some of the most popular real estate websites of our times. Here, you can choose real estate specific themes, drag and drop content elements, add images, graphics, change font and color, embed widgets, all in a matter of minutes. Also, marketing solutions like social media integrations, listings submissions options, newsletter campaigns, QR code generator and printable stickers make RealEstateSites a smart choice for real estate agents and brokers. This platform’s real-time editor comes with tons of templates, themes, and graphics, all compatible with various screen resolutions and OS. Here you can even build image galleries, slide shows and establish events for showcasing the property listings clearly. The QR code generator links your website with major search engine databases and directories worldwide thereby boosting your overall reach and appeal immensely. RealEstateSites also has its own Facebook application where you can update the contents of your Business page in just a few clicks. GoDaddy is one of the biggest domain registration platforms and currently supports thousands of businesses (both established and growing start-ups) in the market. However, most people are unaware of the website building options that GoDaddy provides. From round the clock customer support to consistent web presence, strong SEO and e-commerce, you get it all here. Moreover, the fact that GoDaddy offers the perfect templates for real estate websites makes it a smart choice for property agents, brokers, and entrepreneurs. The simple, minimalistic and clutter-free interface is intuitive and very professional. All you have to do is drag/drop your favorite template, insert the content, add images and graphics, add colors, embed widgets and customize the page to your liking. Users also get the option of getting a preview of their website as to how it would appear in the web browser once published. In-built SEO, CRM integration, CMS solutions, newsletter campaigns, e-commerce support and social media networking boosts the performance of your website tenfold. Lastly, GoDaddy also automatically customizes the contents of your website into a more mobile-friendly display for easy mobile access. What's not to like about Easy Agent Pro? They offer complete websites for real estate agents via LeadSites and have a robust system to help agents generate new leads. They offer 16+ lead apps, unlimited landing pages, automatic text followup, CRM linkup, blog articles, local MLS integration, and a host of other relevant options to help new and experienced agents alike reach their maximum online potential. The dashboard is easy to use and even agents who are tech averse can quickly and easily navigate through the system to add, change, or delete information. They offer pro templates and customization options for those who want a specific look/feel to their site. Their visitor tracking and smarter insights options help agents pinpoint where on your site consumers are visiting and how long they are staying there. Lastly, they offer tremendous customer support and helpful online resources to point you in the right direction. REW has helped thousands of agents since 2004 to develop a web presence via an innovative web design approach and proven SEO techniques. They offer a suite of choices including sites for agents, teams, and brokerages. If you are looking for a modern website with built-in-IDX as well as lead and content management, they are certainly an option to consider. You have the choice of using one of their template websites or looking-outside-the-box and going with a fully custom real estate website. Visit their corporate site, check out all the details (including site examples), and determine if they are the right choice for your specific real estate needs. Starting a real estate business is not an easy task. You need to be well-connected and have credible market sources and solutions in order to connect with the end-user and appeal to his psyche. Thanks to real estate websites brokers and property agents worldwide can now contact and connect with prospective clients and make deals immediately. Even buyers can check the authenticity and credibility of the said property without actually having to visit the place. It thus saves you a lot of time and effort. Buying and selling the property has never been more convenient. The website builders mentioned above are but a few of the best platforms out there. Consider the size, scale, and aim of your business before choosing any site builder.